Choosing the right dimmer/bulb combination can be a confusing task, especially since there are so many different types of dimmers and bulbs available. Be sure to read the labels carefully for guidance because the best way to get optimal performance from your dimmer is to ensure that the bulb you use with it is compatible. Single Pole - On/Off control and dimming of the light from a single location. 3-Way - On/Off control of the light from two locations. The main dimmer is in one location and the remote is in the second. 3-way is typically used in kitchens or hallways. 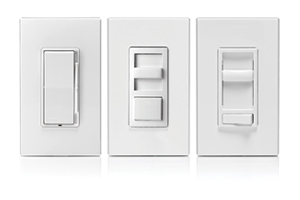 Multi-Location - On/Off control and dimming of the light from three or more locations. The main dimmer is in one location and the remotes are in the additional locations. This format is typically used in great rooms, so the same lights can be controlled from multiple locations throughout the room. *Be sure to reference the packaging to choose the dimmer wiring option best suited for your needs. These dimmers have embraced smart technology, making dimming not only about ambiance control but about convenience as well. 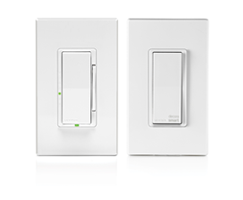 Smart dimmers let you dim, time and switch your lights on and off from your smartphone or tablet using your preferred technology - Wi-Fi®, Z-Wave®, HomeKit™, or Bluetooth®. They are all compatible with LED bulbs, so any choice is the right choice. 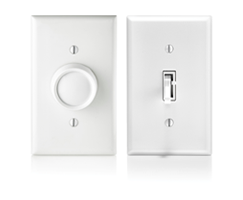 These contemporary dimmers all feature a slide bar for dimming and either a rocker switch or push button for ON/OFF.They each have a different look for individual style preferences. The perfect complement for traditional décor, these rotary or toggle models let you enjoy the latest dimming functionalities without compromising retro style. There’s still a lot to learn so be sure to download our Dimmer Buying Guide for all the details!